Autumn. September. Time to get back to school. Streets are full of motorcycles with students in uniform at the back seat carrying colorful backpacks. School entrance is a battleground of various sounds demanding to be heard: lively music celebrating the wonderful student life and how exciting it is to learn new things, chattering from breakfast vendors whose trade relies entirely on a bicycle, gas buzzing from the pump of balloon sellers (my primary school requires each student to bring a balloon to release to the sky so yes balloon business thrives on 5th September), and of course the first-school-day encouraging and motivating conversations between parents and their children. That is the picture you can paint for any primary schools. When students grow older, 5th September seems less of a fun fair and more of an orderly unloading bay, where parents drop children off and then leave for work. The best business to engage in if you live around any schools is to sell breakfast because duh! the most important meal of the day. I spent my first nine years of education in a small area with one kindergarten, one primary school and two secondary schools. You literally can never walk away from schools. Needless to say I was spoiled for choice with the variety, from soupy dishes like phở (the beef noddle) or hủ tiếu (pork rice noodle) to bánh mì (baguettes) and xôi anything. 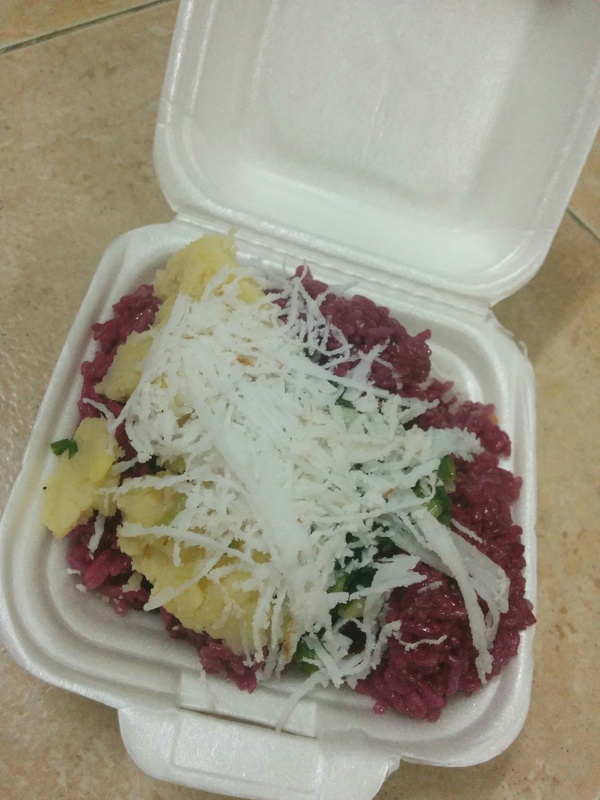 In Vietnamese, nếp (glutinous rice) refers to the raw uncooked grain while xôi (no English equivalent or none that I know of) is the finished dish. Coupled xôi with almost any ingredients savory and sweet, you just got yourself a wholesome breakfast dish. 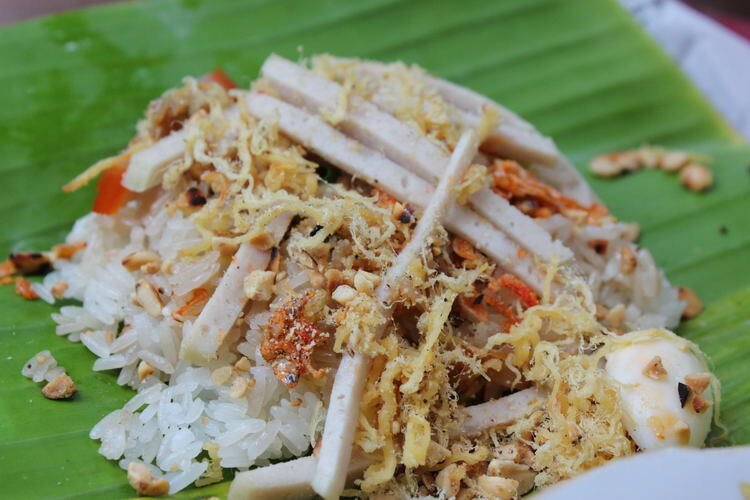 In the old days, vendors used to sell xôi wrapped in a banana leaf which went with a spoon also out of banana leaf. These days most of the time you will see xôi in a styrofoam box or a grease-proof packaging made by old newspaper inserted into a clear plastic bag. Here, have your xôi while catching up with current affairs. The toppings vary from shop to shop. However, the must-haves are spring onion oil, chả lụa (Vietnamese meatloaf I supposed ), and roasted peanut to garnish. Some shops go creative and add a bunch of other ingredients such as roasted chicken, braised chicken gizzard or char siew. 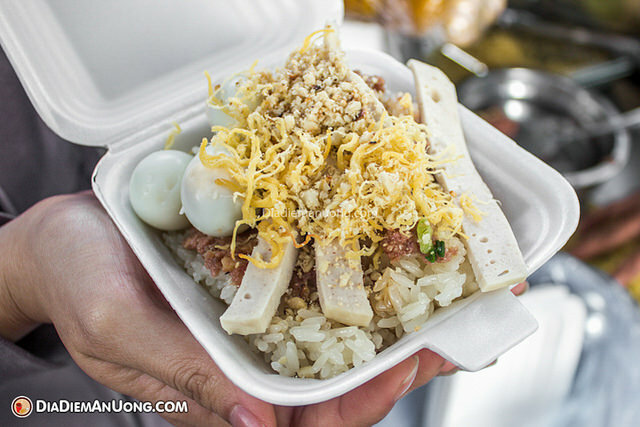 One popular spot in Ho Chi Minh City where people go for the variety of savory xôi is at the corner of Bùi Thị Xuân and Cống Quỳnh streets, where you can find all sorts of xôi and snacks. To me they all have their merits but nothing beats a basic xôi mặn in the morning: chả lụa, Chinese sausage (lạp xưởng), floss (chà bông), pâté (patê) and a hard-boiled quail egg. It is filling but not so heavy that you will be too full for lunch. Like their savory counterpart, the sweet version can also be paired with endless possibilities of toppings. My grandmother likes to order a pack of this sweet xôi filled with green bean paste and shredded coconut sprinkled with toasted sesame seeds and crushed peanut. At your request, the vendor will give you a separate small pack of coconut milk to go with it later (more coconut milk please). You can also find xôi ngọt wrapped in a thin wafer (bánh phồng) like a burrito. This is my favorite of all as 1) it’s so convenient when you’re on the go (no utensil required) and 2) one bite will give all the essence of the xôi. Unfortunately, bánh phồng is not very commonly seen in the city. 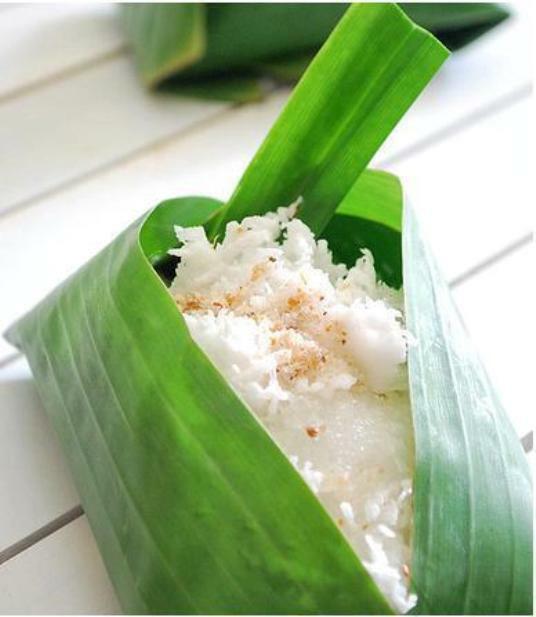 The cooking of glutinous rice for sweet xôi offers you more choices. Xôi lá dứa (pandan) is infused with pandan leaves for a light fragrance and fresh green color while xôi gấc carries a nutty taste in a vibrant red. Want more texture? 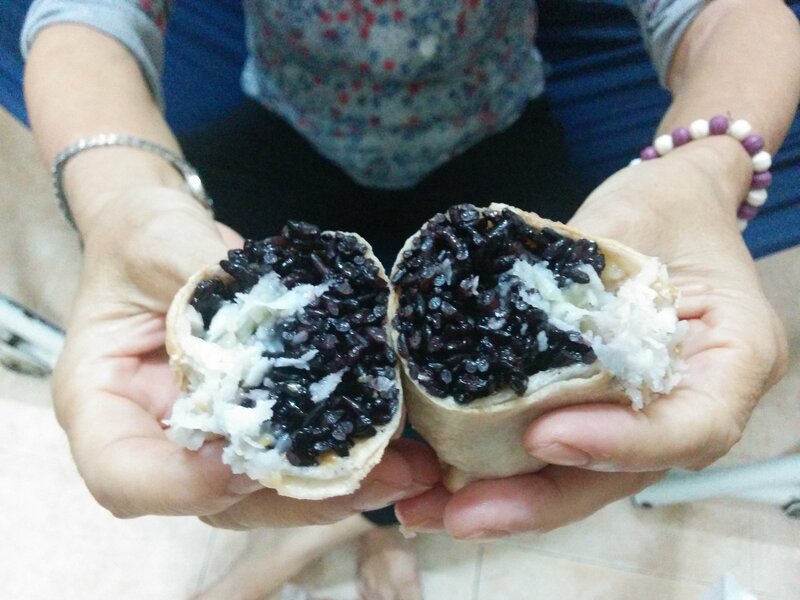 Try xôi đậu đen (black bean) or đậu phộng (peanut). Want something more interesting? Try xôi lá cẩm, a cross between sweet and savory as the purple xôi (soaked in water with a leave called magenta) is covered in a thin layer of green bean paste, sugar, and guess what … spring onion oil (or lard). To make it even better, splash a tablespoon or so of coconut milk when served, how about that? It sounds like a weird combination but the taste just blends so well. This is by no means a complete list of xôi you should try in Vietnam but a collection of my xôi memory. You know how sometimes a scent or a taste takes you back to a particular experience in the past? To me xôi is the scent of school, of those early mornings on my dad’s bike breathing in the cold air, of the simple happiness opening my pack of xôi comparing it with other kids and of a time when life was so carefree and simple. Arghhh reading this at dinner is not fun at all.. I miss it so much. My favorite is xôi xéo though. Not sure if I can find it in the South..
Yea you can (check Xôi Nhung or Phở Thìn in HCMC), although it’s not as widely seen as the others.